PARKDEAN Resorts has revealed its commitment to continued investment through plans to invest £42M across its parks this year, with a primary focus on new accommodation. Following a record £50M worth of investment last year, the 2018 roll out takes Parkdean Resorts’ investment total to £130M since 2016. The business now has 72% double glazed and central heated caravans due to an increase of over 1,450 in the last three years. Due to demand and new accommodation, more parks were open for February half-term than ever before. A total of 27 parks, eight more than the previous year, welcomed 2018’s first holidaymakers. The company is spending £13M on 800 new caravans to meet higher demand for holidays and ownership opportunities. In response to customer feedback, these models will include the introduction of more one and four-bedroom caravans – and particularly those with a higher specification. Features include en-suite bathrooms, new and upgraded entertainment units, spacious seating and homely touches to ensure a really enjoyable stay. Vauxhall in Great Yarmouth, one of the company’s biggest parks, has enjoyed an extensive replacement programme since its acquisition by Parkdean Resorts in 2016. The park will welcome 60 modern double-glazed and centrally-heated models to upgrade the caravan offering on park. This includes the extra wide and extra-long Victory Belmor, which has a central lounge layout and bedrooms and bathrooms at both ends, making it ideal for families or couples sharing. The brand new, four bedroom Willerby Lymington will too be introduced to a selection of parks. With its central lounge layout, a double and twin room at each end and a veranda, it offers plenty of space for families. New lodges including a range of four-bedroom models are also set to be added to a variety of parks offering wider choice following a £1.3M investment. The 20 new four-bedroom lodges boast features designed around comfort and style, such as patio doors leading out onto verandas, bigger bathrooms and spacious dining areas. Nodes Point on the Isle of Wight is receiving 11 new lodges in a £0.75M investment – six for holidaymakers and five for ownership opportunities. Meanwhile £0.52M will bring four luxury lodges with hot tubs to the popular Fallbarrow Holiday Park in the Lake District. A further £3.9M has been allocated to refurbishing existing accommodation to enhance holidaymakers’ experience. Additionally, upgrades to retail and leisure facilities will be completed for the 2018 season, as well as extensions of touring and camping areas at key parks. “In 2018 we have a focus on bringing in new caravans and lodges to follow the growth in consumer demand. We also regularly collect guest feedback, and from this made the decision to introduce more one and four-bedroom models. For more information on Parkdean Resorts visit www.parkdeanresorts.co.uk. Overall the four parks in the Lake District region will receive £0.95M. Scottish parks are set for a £2.5M boost. A total of £0.45M will be used to add caravan and touring and camping pitches to Nairn Lochloy in Inverness, as well as a new shower block for touring and camping guests, and an exciting outdoor children’s play area. In support of the local area the business will also be investing in upgrading the nearby public toilet facilities owned by The Highland Council. Elsewhere in Scotland, £0.15M will revamp the bar and restaurant at Grannie’s Heilan’ Hame in Sutherland to create an enhanced area for dining and socialising, and Sundrum Castle in Ayrshire will have an arcade refresh and new reception area. On the Isle of Wight almost £3M will be spent across park accommodation and facilities. Landguard‘s Granary Restaurant will become the Boathouse Restaurant and Bar with a refurbishment, and the park’s outdoor swimming pool will be upgraded ahead of the warmer weather arriving, following a total £0.3M cash injection. The parks in the South West will benefit from over £7M, seeing £3.2M spent on new accommodation. Warmwell in Dorset will welcome new lodges, with hot tubs installed in selected accommodation. A £0.275M showbar and arcade revamp will also take place, and further arcade works will be completed at Mullion in Cornwall. Parkdean Resorts’ five Welsh parks will benefit from a £3.6M investment, with £1.3M invested in new accommodation. Plus, £0.2M will update the showbar at one of the UK’s largest holiday parks Trecco Bay in Porthcawl. In Conwy which is home to Ty Mawr, over £0.275M will refresh its arcade – a favourite with younger holidaymakers, and there’ll be additions to its outdoor play area including adventure golf and an area for toddlers. As part of a £4.9M investment in East Anglia and Lincolnshire, £2.8M has been allocated to bring in new caravans and lodges for the 2018 season. Vauxhall Holiday Park will benefit from a brand new children’s play area where children will love flying down the aerial zipwire, scaling heights to reach the new viewing platforms and zooming down the vortex slide. Meanwhile, over £1M has been outlined for Essex, where £0.165M will add an impressive new fish and chip shop to Highfield Grange, whilst Naze Marine is gearing up for an exciting showbar refit, and new caravans will be added to the parks across the area. Spend in other regions will see £1.4M invested in parks in Kent and Sussex, £0.58M in Lancashire, £1.8M on accommodation in the North East and Yorkshire, and £0.25M to enhance the touring and camping facilities at six parks. Additional funds will be utilised across the regions on maintenance and infrastructure works. For all media enquiries, photography requests or more information please contact Kayleigh Hepburn or Sally Crossley by emailingkayleigh@opr.co.uk / sally@opr.co.uk or call 0191 232 5690. Parkdean Resorts is the largest holiday park operator in the UK with 72 parks, following the merger of Parkdean Holidays and Park Resorts in 2015. Holidaymakers have an unrivalled choice from one operator of holidays and short breaks across the UK in Cornwall, Devon, Dorset, East Anglia and Lincolnshire, Essex, Hampshire, Isle of Wight, Kent and Sussex, Lake District, Lancashire, Northumberland and County Durham, Yorkshire, Scotland and Wales. 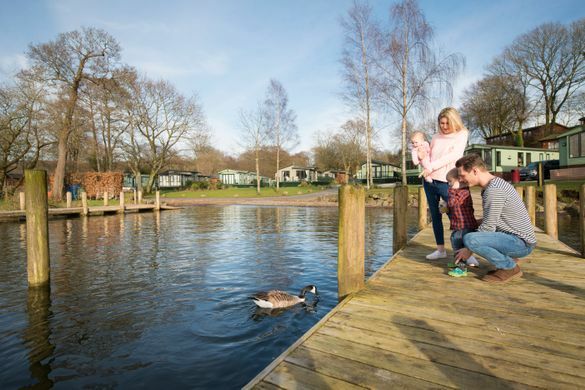 A varied range of accommodation options are available on a break with Parkdean Resorts, including caravans, lodges and glamping, as well as taking a touring or camping pitch. There’s also the option to own a caravan or lodge holiday home at 67 of the parks, meaning holidays can be enjoyed more frequently. For the second consecutive year, Parkdean Resorts was named Best UK Family Holiday Parks Operator and Best Camping & Mobile Holiday Company at the British Travel Awards in 2017, and Best Holiday Park at The Group Leisure & Travel Awards in October 2017.